It’s early autumn in the north Adriatic, in the waters south of Istria. Two lighthouse keepers live together with their wives on Porer rock. As the bura, a strong and unfavorable wind, slowly gains strength, the two couples shut all the doors and windows and decide to kill time by playing cards. They all enjoy the game and good company, not expecting any stress because no one sane would sail out when they predict bura in those waters. However, their idyllic afternoon is being disturbed by an urgent radio call. Some barely understandable voice is shouting something about sinking. After a few unsuccessful attempts, the lighthouse keeper manages to understand that there are two Swiss sailing boats with 4 adults and 8 kids aboard. A strong gust of bura has severely damaged their rigging so the masts of both sailing boats have collapsed. 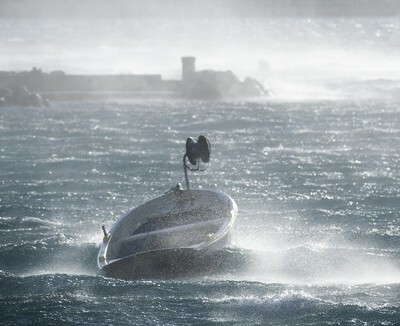 As they are unable to navigate, the wind, accompanied by big waves, is blowing their boats towards some island. “Give me your coordinates!” shouts one lighthouse keeper while his fellow is opening the chart, taking the notes and calculating the position. His result shows that the boats in need are sailing the border between Croatia and Hungary. Anyone who knows anything about geography knows that the only sea on that location is the Pannonian Sea. The only trouble with it is the fact that the Pannonian Sea doesn’t exist for several million years now. “Please check your coordinates once again!” shouts the lighthouse keeper in the radio, pretty aware of the panic aboard the boats in danger. If this were some other situation, he would be wiping the tears of laughter from his eyes and holding his abdomen. This situation, however, is very grave. Luckily, the second attempt at positioning is successful, so the lighthouse keepers learn that the Swiss are being drifted towards the unfriendly shores of Pag. As one lighthouse keeper tries to calm down the skipper, giving him advice about stabilizing the yacht, his colleague calls the naval police, Rijeka Harbor Master and other vessels in the area, giving them the correct position of the unfortunate sailors. The coastal search and rescue teams take off in record-breaking time and approach the Swiss sailors just in time to save them from those nasty rocks. The card game on Porer lighthouse never ended but some lives and goods were saved thanks to the lucid lighthouse keepers, who wanted nothing more than to spend a calm afternoon in the dry and warm lighthouse.